Dr. Corey M. Brooks is Assistant Professor of History at York College of Pennsylvania. His forthcoming book is Liberty Power: Antislavery Third Parties and the Transformation of American Politics (University of Chicago Press). He is currently researching public memory of Roger Taney in Maryland and Washington, D.C. He resides in Baltimore City. Perhaps a fuller appreciation of the histories of Taney’s most controversial decision and of the state’s statue honoring him might complicate our, and Governor Hogan’s, thinking. 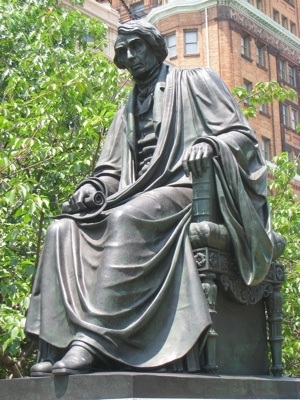 Taney, though he presided over the Supreme Court for twenty-eight years, is best remembered for his infamous 1857 Dred Scott decision, wherein Taneyasserted that black men “had no rights which a white man was bound to respect.” Taney’s apologists have long noted that decades earlier he had freed his own slaves and that the Dred Scott decision’s most quoted line referred not to personal attitudes but to historical facts—as Taney interpreted them. But, by the estimation of both antislavery contemporaries and most modern historians, Taney willfully misread the several states’ histories on the question of black citizenship. At the time, however, this was not even Taney’s most controversial conclusion. Accepting an argument advanced by the most extreme proslavery zealots, Taney issued a sweeping ruling that Congress never had any power to prohibit slavery anywhere. Antislavery Republicans insisted that freedom was national and slavery was legal only where established by local (state) laws. Taney said slavery, in fact, was national; freedom was only local. In the face of Republican efforts to halt slavery’s expansion, Taney attempted to write a permanent federal protection for southern slavery into a Constitution that was inherently ambiguous about the federal government’s relationship to property in man. His decision thus offered the potential to guarantee the westward spread of American slavery and protect the institution in perpetuity. Though the federal bust bill ultimately passed quietly in 1874 (along with one for the recently deceased antislavery Chief Justice Salmon Chase), in the interim Maryland’s Democratic legislature voted in 1867 to commission the statue now standing on the State House lawn. At the 1872 unveiling, the keynote speaker, University of Maryland Provost Severn Teackle Wallis (himself a Confederate sympathizer later immortalized, like Taney had been in 1887, in Baltimore’s Mount Vernon Place), made clear that the State House monument stood not just as tribute to an accomplished jurist, but also as Maryland’s “protest in the living bronze” against Republican politicians who had “traduced and ostracized” the man Wallis exalted as the “champion” of “free institutions.” Wallis’s oration omitted Dred Scott, but it could not have been far from Marylanders’ minds. Five years prior, when the state senate debated the initial $5,000 appropriate for the Annapolis sculpture, a handful of Republicans opposed the “monument to a man who had made a decision that involved the country in the greatest war that had ever been known.” But the legislature voted overwhelmingly to memorialize Taney, and one Democrat unequivocally pronounced that “the decision in the Dred Scott case was not only just, righteous and right, but endorsed by the State of Maryland to-day .” So we probably shouldn’t view the Taney statue as just an innocuous honor to the Old Line State’s highest-achieving judge, but also as a conscious endorsement of racial inequality. Governor Hogan may have a point that we should be wary of entirely effacing shameful aspects of our history. But we needn’t celebrate them. Those demanding removal of the statue have a legitimate grievance and should not be flippantly dismissed. Even if we don’t move the statue, let’s at least be honest about what it means. In 2009, the city of Frederick, Maryland added a large plaque to its City Hall display of a 1931 Taney bust. The plaque pointedly explained the impact of the Dred Scott decision. This would be a good start in Annapolis, but if we want to understand the significance of the most prominent statue on the Maryland State House lawn, a new historical marker should explain not just how Taney advocated for slavery and racial inequality during his life, but also the sad truth about why post-emancipation white Marylanders were so adamant that he be publicly honored after his death. Longstanding conflicts over Civil War memory have never been merely about “political correctness” or being “sensitive.” These debates are about pursuing historical “correctness.” We must be committed to seeking a truer understanding of our society’s past, or we will remain ill-equipped to deal with its complicated legacies in our present and future.